Unsung heroes who make a real difference to the lives of those around them are set to be recognised once again thanks to the Good Neighbours Awards. Now in its fourth year, Blackburn with Darwen Council has teamed up with the Lancashire Telegraph to search for the people who go out of their way to help residents in their communities – or just want to make their neighbourhoods better places to live. Building on the success of the past three years, the awards pay tribute to residents whose efforts are rarely recognised. They are a brilliant way for people to say thank-you to neighbours who go above and beyond, but don’t expect any reward. Prizes on offer for this year’s awards include a meal for two at Ewood Park, a £150 voucher for Stanley House Hotel and Spa in Mellor, £50 Mall shopping vouchers, a Kindle from the Lancashire Telegraph and a year’s leisure membership at re:fresh gyms or tickets to the panto. This year Community Integrated Care, whose new £4.8million EachStep Blackburn will provide specialist support for people in the borough living with dementia, are also supporting the awards. As are McDonald’s, whose staff give up their time regularly to spruce up the area. Last year’s winners included community event arranger Janice O’Malley for organising community events including family days and sports days, and songbird Joyce Kearton for providing entertainment at numerous Your Call events such as the Just Good Friends afternoons for pensioners. Paul Green also won for his work picking up rubbish and helping at Ivy Street Community Centre. I am really looking forward to this year’s awards and meeting people who make their communities tick. Since they began, the awards have recognised dozens of people who have made a massive difference to the lives of their neighbours. 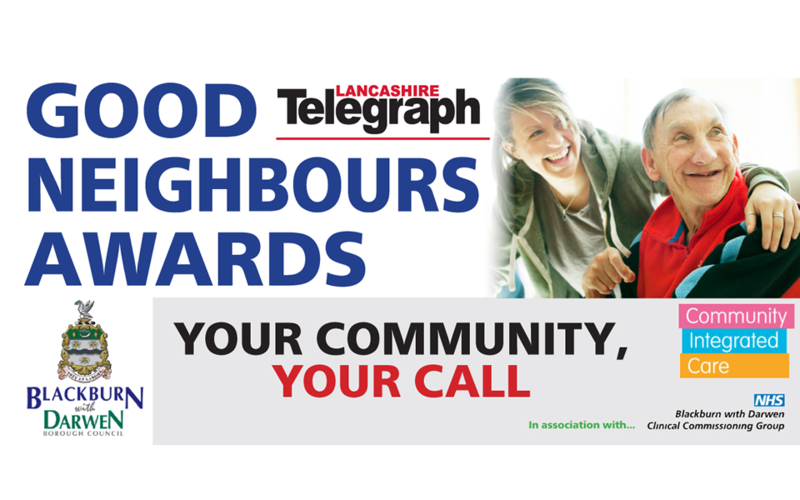 Community Integrated Care is excited to be backing the Good Neighbours Awards, which celebrate the wonderful sense of community spirit in Blackburn. Our charity is excited to be opening our new specialist dementia care service, EachStep Blackburn, in summer 2016. “We want to play an active role in the Blackburn community – sharing our talents, resources and specialist approach to care to make the biggest difference possible. It is fitting that we’re supporting these awards, that recognise others who are also committed to giving back. We look forward to meeting some heroes of the local community at the event. This is a great scheme which recognises all those who work tirelessly and selflessly in the community, helping others in need. Good neighbours play a huge role in improving the health and well being of our residents and communities. We are once again delighted to support such a worthy cause. “We have enjoyed hosting some of the winners at Ewood Park and our training ground over the past two years and will look forward to offering another warm Rovers welcome to some of the local community’s unsung heroes again later this year. We are happy to be sponsoring this very successful event again this year. The competition allows residents the opportunity to thank their fellow neighbours for helping them or going the extra mile throughout the year. To nominate please fill out this form.